Erica adored visiting Cootehill and her Grandparents, the Fitzpatricks, Station Rd. This Fairy Forest was created, by her parents, to honour Erica’s memory and her unshakeable belief in fairies and magical kingdoms. All great classic Fairy Stories are constructed around, unexpected, challenges. Erica’s challenge was childhood cancer. Sadly, Erica encountered far too many brave princes and princesses fighting the same battle of childhood cancer. Some of them winning. Some of them losing. Fairy Stories contain amazing feats of courage and resilience. Erica’s, fierce, determination to live her short life to the fullest, inspired and touched all who shared her journey. Kindness and love triumph in all Fairy Stories. This Fairy Forest is a, heartfelt, ‘Thank you’ from Erica’s parents and sister, to the people of Cootehill for their, unforgettable, kindness and support. If their love and kindness could have cured Erica, she would, undoubtedly, have skipped and danced through this enchanting forest. Erica had her own personal fairy-Raymond. Erica’s world was populated with princes and princesses. It was sprinkled with fairy dust and glitter. Accessorised with magic wands and fancy dress costumes. Aged 5, Erica swapped her crown for a halo. 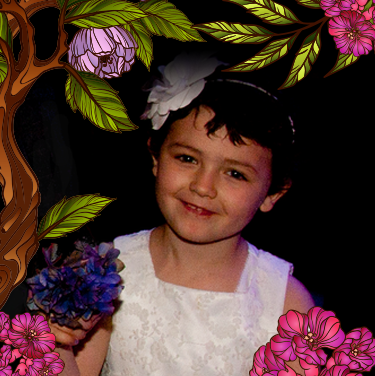 For her parents, Ciarán and Natasha, and her little sister, Layla, their deepest wish is that all, who visit Erica’s Fairy Forest, will have that same sense of wonder and delight in all things magical.